The RBL had kindly donated some 'Somme 100' enamel pin badges which John gave to Patricia to distribute, which was much appreciated. One shown here, but one also visible on René's coat! 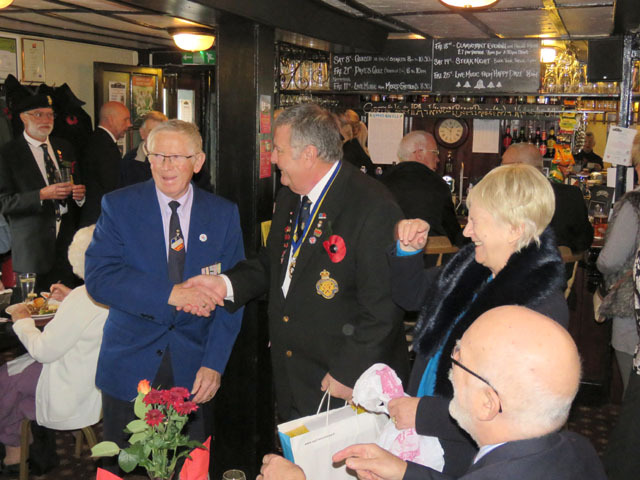 John of the Royal British Legion (who volunteered to drive, well done John), Bill, Lesley and I (Nick) set off at 05:00 from Eastry, unfortunately, Maurice also of the RBL was unable to join us on the day. Original plans had been to take the ferry for the crossing to France using a complimentary ticket, but owing to complications obtaining the ticket and the difficulties with timings, a bilateral decision was made to use Eurotunnel. The drive to Longpré went according to plan although John's sat-nav seemed insistent we left the motorway and set off in a random direction, I'm still wondering where we might have ended up had we followed it, or if not where, at least what mysterious route we would have taken; once I'd got John's confidence, he turned off the sat-nav. Patricia, President of Longpré jumelage had kindly invited us for breakfast and we arrived at her house at the same time she was returning with arms full of baguettes and croissants, a welcome sight! After a hearty breakfast we made our way to the small British cemetery on the edge of the village. 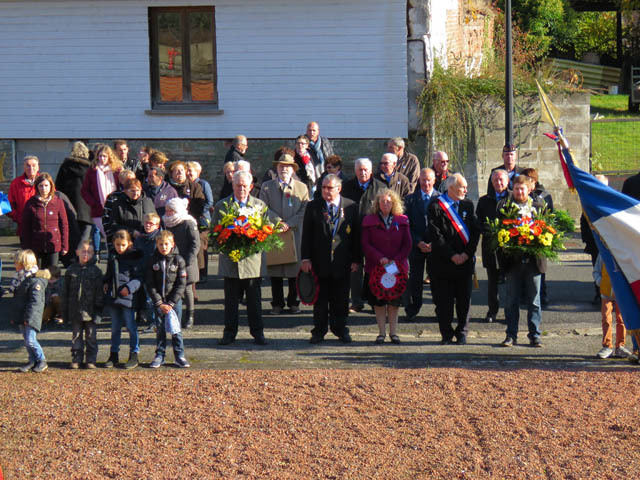 John, Bill and Mayor of Longpré René laid wreaths, the 'Ode of Remembrance' was recited and a minute silence was observed before we made our way back to the village Hotel de Ville. Monument to the memory of 5th and 6th June 1940. 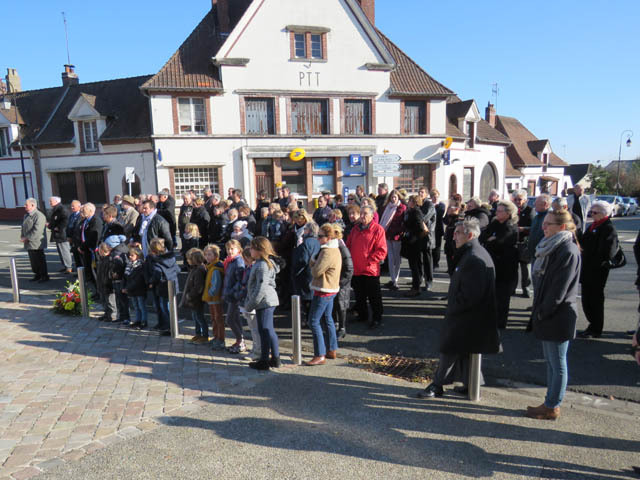 From the Town Hall we made our way in bright sunshine and clear blue skies to the church for the Service of Remembrance conducted by Mme Guylaine, with readings from various members of the congregation; Lesley gave a reading in English, the 2nd Letter of Saint John, Ch. 2 ver4-9. From the church the congregation processed around the village to the two memorials. Firstly to the Monument to the Dead 1914-18, and from there to the Monument to the memory of 5th and 6th June 1940. 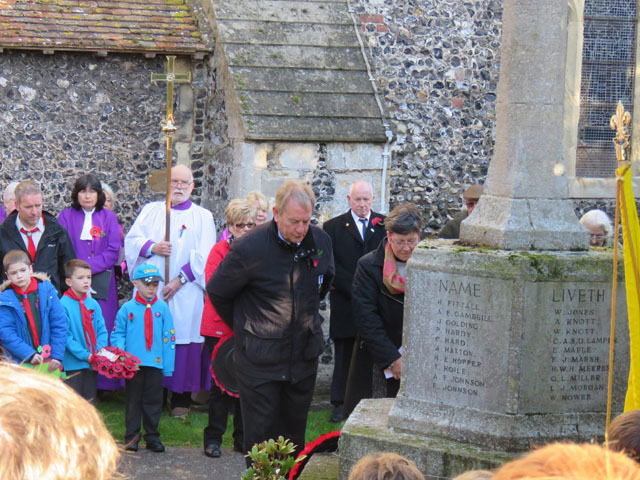 Wreaths were laid at both monuments by Eastry Twinning Association , Royal British Legion and of course, from the people of Longpré. Finally, at the Hotel de Ville the Mayor thanked the standard bearers and everyone was invited in for a 'vin d'honneur'. Patricia took us back the little British cemetery as John had not had a chance to see it - we were a little short of time before, and then home for lunch. She'd prepared a very tasty starter and main course for us, and then we were joined by René, Paulette and Bill, Monique, Martine, Vincent and Candice who'd brought deserts with them. 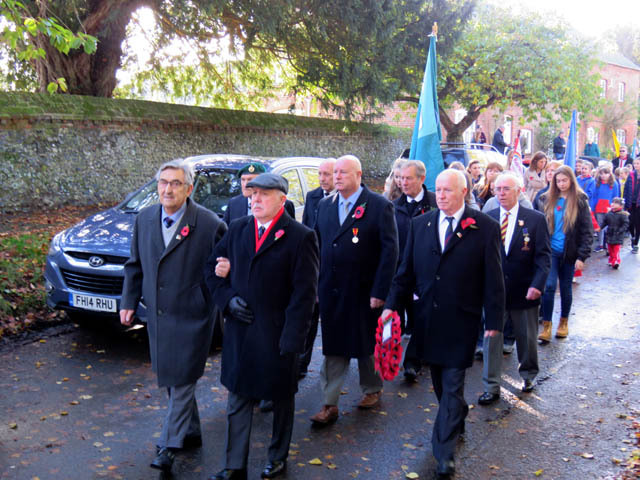 It was a very convivial day, everything had gone to plan and we hoped the same would be true for their visit to us on Remembrance Sunday. 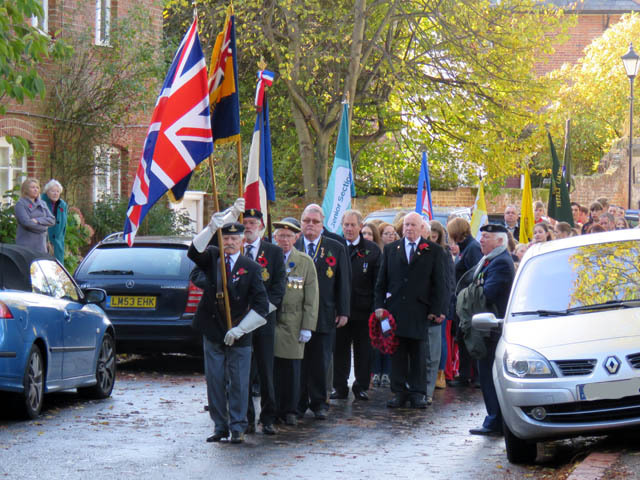 Although we'd had a bit of rain overnight, Remembrance Sunday was dry and bright by the time we all gathered in Church Street for the parade to the memorial. Our French guests had arrived safely, Patricia the driver, at about 09:30. Thanks to Ken and Sue for hosting them for breakfast and getting them to the parade on time. Travelling over from France was Patricia, Michel and Annie, René (René Bilhaut, not to be confused with René the mayor) and Guylaine. The ceremony is well orchestrated, the names of the fallen are read out, wreaths laid, the Ode to Remembrance recited, silence observed and the Last Post sounded, the latter invariable just as the clock strikes 11, it is a very evocative event and a tribute to those who gave their lives. The Revd. 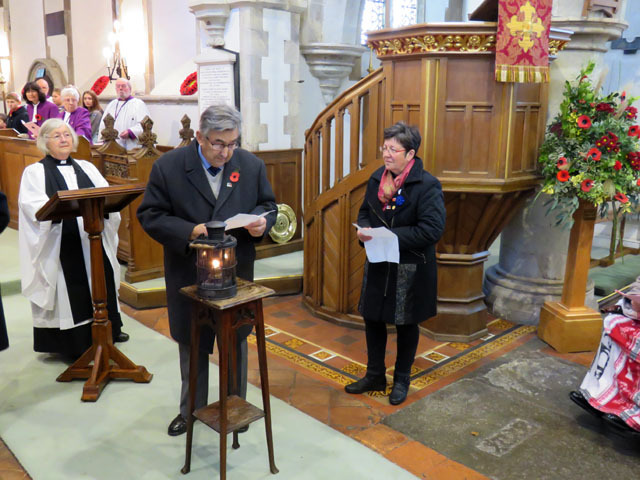 Pilcher conducted proceedings, with a greeting to our guests from a lady chorister in what seemed to me, fluent French. Later, René, who had gifted to Eastry, a 1st World War lantern his father had found in Longpré, was invited to come forward to light the lamp. René, now in his 90th year and not in good health gave a brief, but very emotional speech, saying that he had not returned the lamp but that it was rightfully ours, and that words could not express his gratitude to the British for their efforts during the war, that it had saved them. He also tearfully announced it would be his last trip to Eastry. I hope he is wrong, he has become a part of what defines the Twinning. 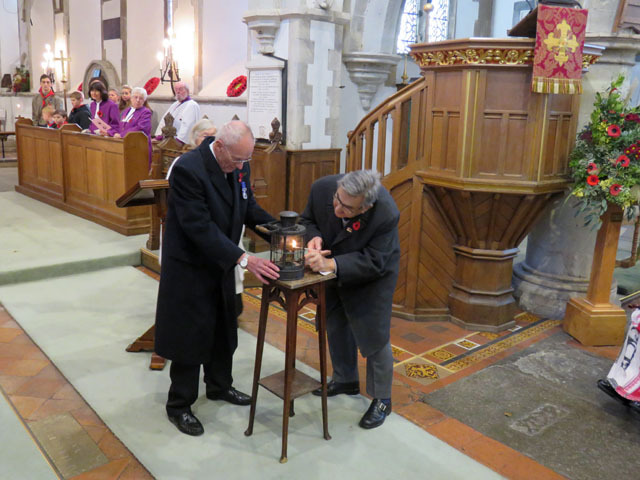 I can't imagine, in 2012 when René presented us with the lamp in Longpré, that he would have ever imagine, in his mid 80s, that he would travel to England and be invited to light the lamp in front of a packed church. I salute him for his bravery in bearing his emotions so openly to us all. Procession to the church, in front René and Terry. 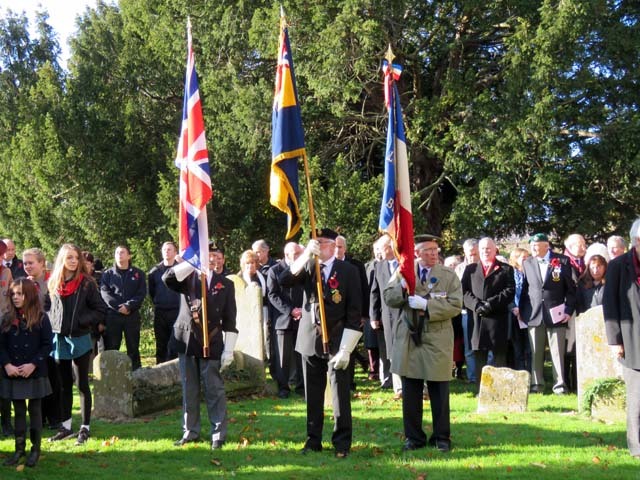 The standard bearers at the memorial. Ken (ETA) and Patricia lay wreaths at the memorial. 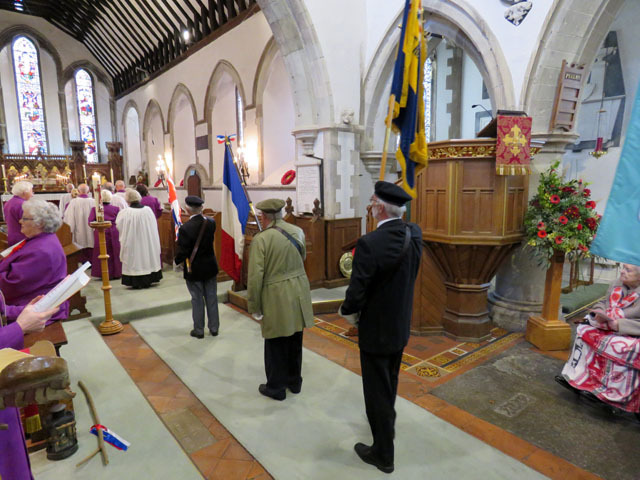 Standard bearers in the church. René lights the WW1 lantern René giving his farewell speech, Patricia translates. 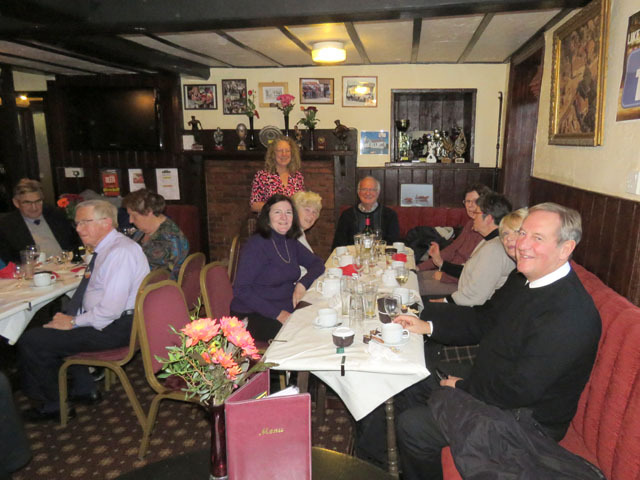 After the ceremony in the church we took our guests to to the 5 Bells for a traditional meal of a 'Sunday roast' - including starter, main course, desert and coffee. Owing to the popularity of the venue, we were in the lounge bar rather than the 'Old Fire Station' which rather than being a problem, suited our group. It felt very 'warm' with members of the RBL - (having given up their usual space to accommodate us) nearby, the atmosphere was very inclusive. 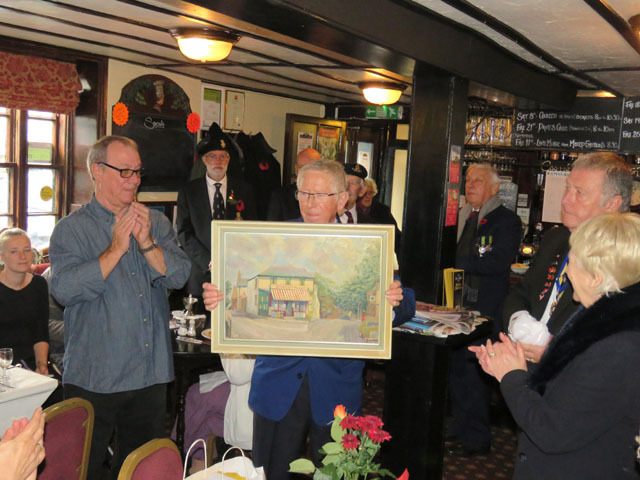 Michel with a painting of 'Bickers' given by Eastry RBL Michel from Longpré and John, Chairman of Eastry RBL Contented diners after the meal in the 5 Bells. The Longpré party had to leave at around 4pm to catch the ferry so we all said our good byes as they departed, it had been a very good weekend and everyone involved said the same. Finally, I would like to say thanks on behalf of Eastry Twinning Association, for the generous gift of wine and chocolates given to us by members of the Longpré jumelage. Le Royal British Legion nous avait très gentillement donné plusieurs insignes émaillés, marqués « Somme 100. » John les a présentés à Patricia pour qu’elle les distribue. On les a beaucoup appréciés. Il y en a un dans la photo et on peut en distinguer un autre affiché au pardessus de René. 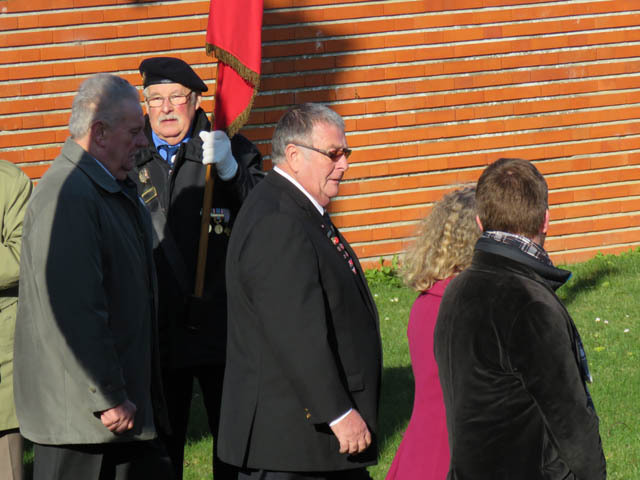 John, membre du RBL (et qui s’est offert volontairement pour la tâche de chauffeur–mille remerciements, John), est parti d’Eastry à 5 heures du matin accompagné de Bill, de Lesley et de moi-même (Nick). Malhesureusement, Maurice, également membre du RBL, au dernier moment n’a pas pu venir. Le plan original c’étaiat d’utiliser un ticket gratuit pour le paquebot. Mais il y a eu des complications pour l’obtenir et des difficultès quant aux heures de départ, de sorte qu’on a décidé bilatéralement de se servir du Tunnel. Le voyage jusqu’à Longpré fut simple, quoique le satellite de navigation de John insistait pour nous faire abandonner l’autoroute et divaguer à l’aventure. Je me demande toujours où nous nous serions trouvés à la fin et quelle route mystérieuse nous aurions suivie pour y arriver. Dès que John a mis sa confiance en moi, il a éteint le sat-nav. Patricia, Présidente de l’amicale de Longpré, nous avait invités au petit déjeuner. Nous sommes arrivés chez elle au moment où elle rentrait à la maison, les bras surchargés de baguettes et de croissants. Ce fut réjouissant à voir. Après un petit déjeuner abondant, nous nous sommes dirigés vers le cimetière britannique au bord du village. John, Bill, et René–le maire de Longpré–ont déposé chacun une couronne. On a récité l’ode traditionnelle et observé le silence pendant une minute avant de retourner à l’Hôtel de Ville. En quittant l’église, l’assistance a dirigé ses pas vers les deux monuments: d’abord le monument aux morts 1914-18, ensuite le monument à la mémoire du 5 et du 6 juin, 1940. L’amicale d’Eastry, le RBL et, naturellement, les citoyens ont déposé chacun une couronne devant tous les deux. Patricia nous a ramenés au cimetière britannique puisque John n’avait pas eu le temps de tout voir auparavant, car nous étions alors un peu pressés. Ensuite nous sommes allés chez elle prendre le déjeuner. Elle avait préparé le premier plat et le plat principal–tous les deux succulents. René, Paulette et Bill, Monique, Martine, Vincent et Candice nous ont réjoints en apportant des desserts variés. 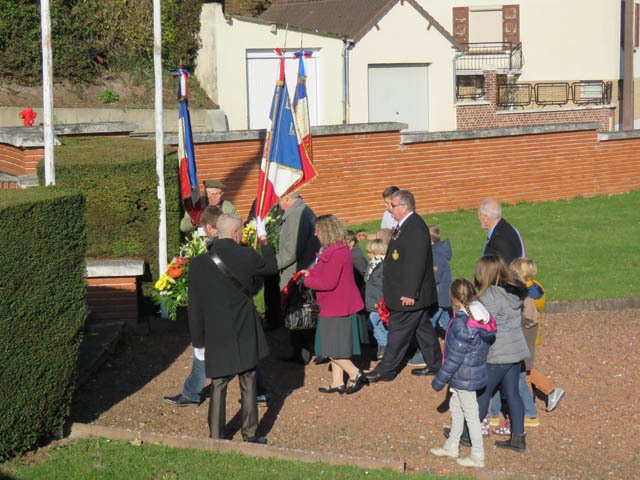 Ce fut une journée entre camarades, tout s’étajit très bien passé, et nous espérions pouvoir réussir autant pendant la visite chez nous, Remembrance Sunday. 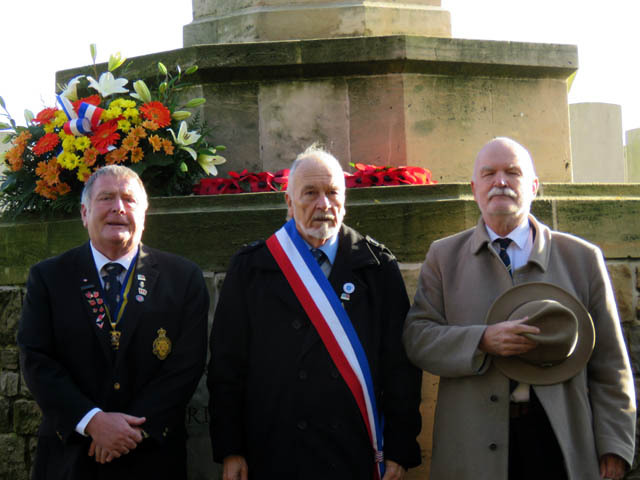 Malgré la pluie légère de la nuit, il ne pleuvait plus Remembrance Sunday, et le soleil brillait lorsque nous nous sommes tous retrouvés dans la Rue Church prêts à défiler au Monument aux Morts. Nos visiteurs français étaient arrivés sains saufs vers 9.30, Patricia les ayant amenés. Tous nos remerciements à Ken et à Sue qui leur avait préparé le petit déjeuner et les ont aidés à arriver à temps pour le cérémonie. En compagnie de Patricia, il y avait Michel et Annie, René (René Bilhaut, non pas René, le maire) et Madame Guylaine qui avaient traversé la Manche. La Révérende Pilcher a conduit l’office, et une chanteuse de choeur a accueillé nos hôtes, impeccablement en français à mon avis. Plus tard, on a invité René à allumer devant toute l’assemblée la lanterne de la première guerre mondiale que son père avait trouvée à Longpré et que René avait donnée aux villageois d’Eastry. René est maintenant âgé de 90 ans et il n’est plus en bonne santé. Il a prononcé un discours bref mais très attendrissant. Il a répété qu’au lieu de nous donner la lanterne, il nous l’avait tout simplement rendue car elle nous appartenait à juste titre; que jamais il ne trouverait les paroles qu’il fallait pour témoigner la reconnaissance aux Britanniques pour leurs efforts au cours de la guerre–efforts qui les avaient sauvés. Les larmes aux yeux, il a annoncé que ceci serait sa dernière visite à Eastry. J’espère qu’il se trompe car il est devenu intégral à la définition du jumelage. En 2012, lorsque René nous a donné la lanterne à Longpré, je n’arrive pas à imaginer moi qu’il aurait jamais imaginé lui, ayant alors quelques quatre-vingts ans, que lui il viendrait en Angleterre où il serait invité à l’allumer devamt une assemblée qui remplissait toute l’église. 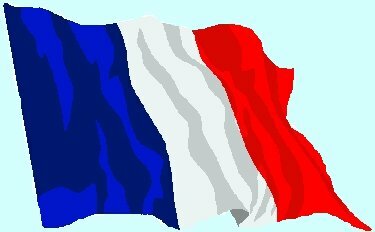 Je le salue pour son courage d’avoir ainsi ouvert son coeur devant tous. Les Longiprates ont dû partir vers 4 heures afin de prendre le paquebot. Alors nous nous sommes dit aurevoir lorsqu’ils nous ont quittés. Le weekend s’était très bien passé. Tout le monde fut d’accord là-dessus. Finalement, de la part d’Eastry, je voudrais remercier nos amis des cadeaux généreux, du vin et des chocolats qu’ils ont offerts à notre amicale.